Grieving Dad In Touching Sept. 11 Photo 'Was Just Honoring Rob' : The Two-Way When Robert Peraza knelt to say a prayer for the son he lost on Sept. 11, 2001, photographer Justin Lane caught the moment. It's one of the most-viewed images from Sunday's 10th anniversary of the terrorist attacks. Robert Peraza, who lost his son Robert David Peraza, pauses at his son's name at the North Pool of the 9/11 Memorial at the site of the World Trade Center. It was perhaps the most touching photo among thousands of poignant images taken on Sunday at the 9/11 Memorial in New York City. 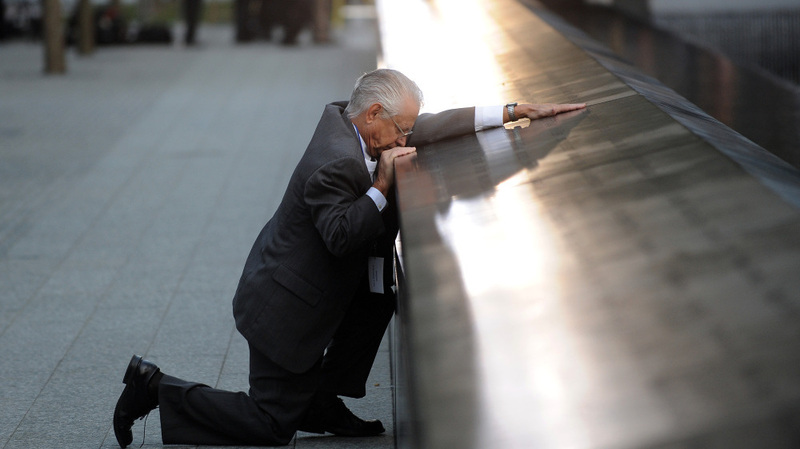 When Robert Peraza knelt to say a prayer for the son he lost on Sept. 11, 2001, photographer Justin Lane caught the moment. We, along with many others in the news media, then spread the image around the world. And the grieving father's moment has become, as ABC News reports, one of the most viewed photos from Sunday's 10th anniversary of the terrorist attacks. Peraza, 68, tells ABC "I was just honoring Rob. ... I was saying a prayer for his soul." Thirty-year-old Rob Peraza was on the 104th floor of the World Trade Center's north tower on Sept. 11, 2001. He was a trader with the firm Cantor Fitzgerald. "After 9/11 my wife and I realized that life continues and you have two children you have to live for," Robert Peraza told ABC. "Rob was the kind of young man who would have been very upset if my wife and I wilted." The family has established a scholarship fund in Rob's memory at St. Bonaventure University in western New York State, where he earned his undergraduate and masters degrees. So far, about $250,000 has been raised.